AAPtards are celebrating India's loss to Australia - they want Virat Kohli's blood! What has Kejriwal done to our youth?? Not only have their mental faculties been completely high-jacked by a single-source agenda, but their outlook has become so uni-dimensional that they can't think beyond the grudge-ridden, ever-complaining, finger-pointing, self-serving propaganda of dharna man. They want Virat Kohli's blood now; and these morons complain of intolerance. In this case, Vipul is so taken aback by Virat Kohli's support to Jaitley during AAP's DDCA allegations against him, that he's gunning for India to loose to Australia. Though we all know, that his opinion shall change to a complete 180 degree if Kejriwal today endorses Kohli in any mild form ... a tweet will be enough. You see, that'll restore Virat's honest credentials. Such is the mind control. In old days, we used to call it brain-wash, today it's called AAP's youth wing. Dhanya ho tum Kejri baba!! 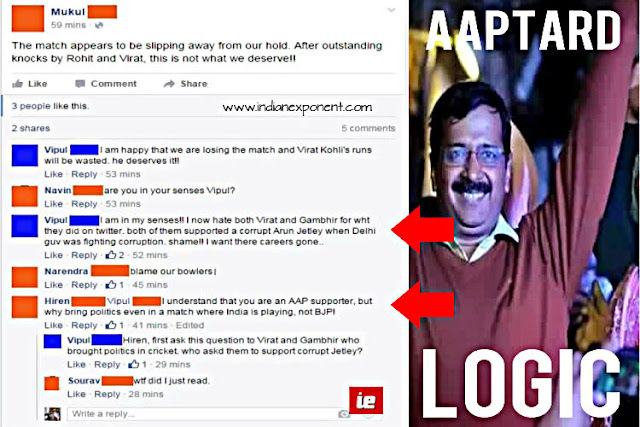 Indian Exponent: AAPtards are celebrating India's loss to Australia - they want Virat Kohli's blood!